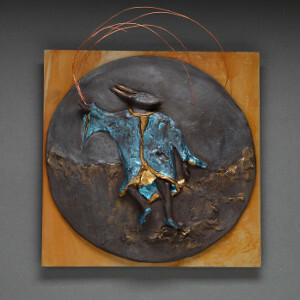 clay, acrylic paint, copper wire, mounted on patinaed metal. 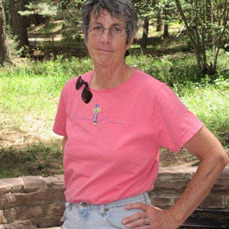 I first began working in clay as a functional potter, working in a number of studios through the years, alternating my clay career with a variety of social service jobs. As my work evolved I became more interested in exploring the expressive and sculptural possibilities of clay, though producing functional work still has a strong appeal for me. Having grown up on a small farm near the shores of Lake Michigan, nature has been an integral part of my life and a comfort and inspiration to me. My work in clay strongly reflects the joy and rejuvenation I find there. Periodically a particular aspect of nature will present itself especially strongly and begin to show up in my work. Most recently the strong personalities and trickster nature of crows and ravens have attracted me. The bas relief sculptures I began in 2010 were initially inspired by a Joy Harjo song that describes 3 crows by the side of the road and the singer's speculation about whether this was a routine coffee klatch or an omen. I was so taken with the image that I had to execute it in clay. 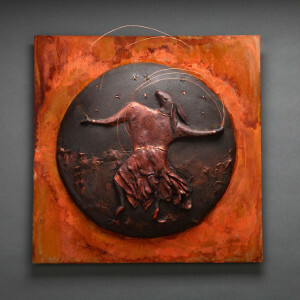 I found I really enjoyed the bas relief process and have made it the focus of my current work. The raven, messenger between the spirit and material worlds, dominates these pieces, but other animals and plants, the landscapes and architecture around me, as well as old pick up trucks have all inspired me. 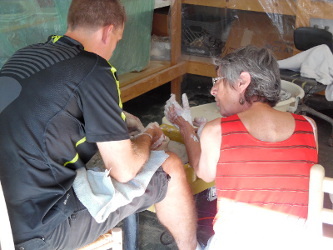 This class will introduce you to the basic concepts of working in clay. By completing a series of projects, you will learn methods of building pieces with slabs and coils, surface decoration and glazing. We'll discuss the different kinds of clay, the different firing methods used to finish the work and how firing process affects the outcome of the piece. Clay , equipment, tools and firing of finished work included in the class fee. The family that plays together... What could be more fun than playing in the mud together? Parents and children. Grandchildren and grandparents. Aunts, uncles, nieces and nephews. Bring everyone. 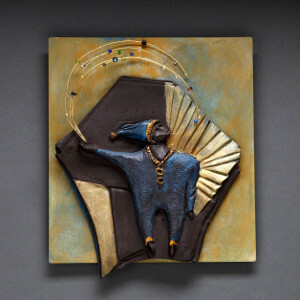 Create a family piece, like a mural or sculpture, or work separately to create individual pieces. The instructor will provide guidance for all ages. Workshops must be scheduled a minimum of 24 hours in advance. Celebrate that special birthday or event by bringing the party to Baca Street Pottery where each participant can create something to remind them of the special day. All work will be fired and delivered at a later date. Children must be at least 6 years old and groups must be accompanied by at least one adult. Events must be scheduled a minimum of 48 hours in advance.